Ram has been on a tear lately so it's disappointing to learn the long-rumored Dakota successor is nowhere on the company's five year business plan. Putting that aside, the plan calls for the brand to increase their sales by approximately 160,000 units by 2018. This could prove challenging as the company's future lineup with mostly consist of facelifted models. Speaking of which, the Ram 1500 will be given a minor facelift in 2015. 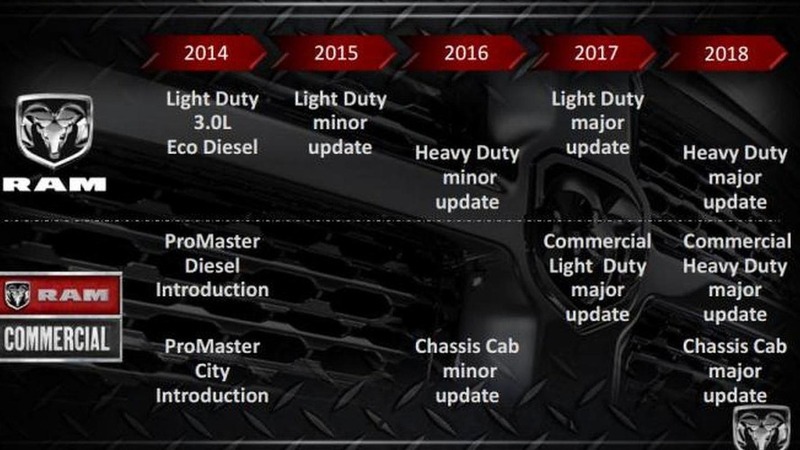 A year later, the heavy duty Rams will be given a minor makeover which will likely echo the standard model. Bigger changes will occur in 2017 as the Ram 1500 is set to receive a "major update." That's pretty vague but the heavy duty Rams will also have a major update in 2018.